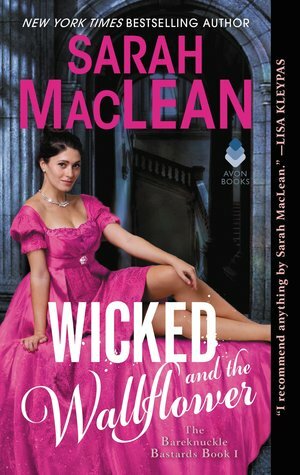 Wicked and the Wallflower by Sarah MacLean. The question, so honest, so forthright, made him want to break down every door she came to from now until the end of time. Wait, you’ll say, didn’t we recently have a YA book by this author? You’d be right, of course … all the points to you in that case, because I only realised this when I sorted my library. Same author, same time period, slightly different age category. Same capturing writing. I knew in theory that the author of The Season had written adult books before and that her genre of choice was historical romance. It just didn’t quite connect in my head. But now I see the parallels of well-written main characters and relationship development. This one is obviously more mature although I wouldn’t necessarily say that it’s overtly racy. The author also opens up quite an intricate plot arc that will carry the reader over the next two books even if they’ll be leaving behind the main characters I grew to like in this one. Fun, with a bit of substance, and very entertaining. If historical romance with a touch of crime detection is your thing, I’d definitely recommend picking up this series. If historical crime detection and a little romantic development are more to your taste, try out the YA. I’ll have a look at the other adult books and semi-patiently wait for the sequel, which was meanly teased in the back of this book and now I really want to read on. Mission accomplished I’d say. Crossing from YA to adult or the other way around can be tricky. But which do you think is trickier? I’m always interested in authors who have made the passage from one side or the other and would be happy about suggestions. Let’s hear from you in the comments! I have read both her adult and YA books but haven't gotten to this one yet. Thanks for reminding me about it. This week I am featuring A Double Life by Flynn Berry. Happy reading!